Camp 15 in Swan Hill must have been bliss for the VEE after the country they had just travelled through and they stayed a week. 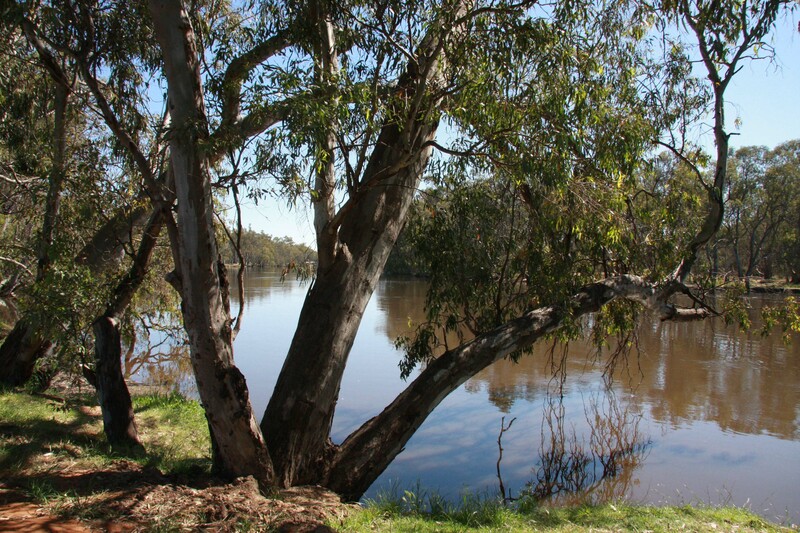 The camp was right on the Murray and the area is now a wonderful riverside camp. Lots of tables, seats and BBQs amongst red gums alongside the Murray, Marg’s favourite river. After enjoying lots of hospitality they crossed the river and set up Camp 16 on the opposite bank. 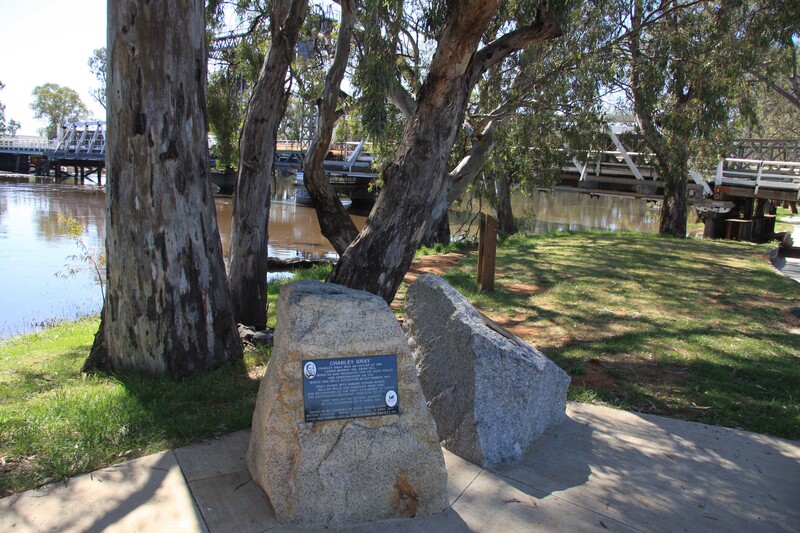 Swan Hill was named by Major Mitchell because of the large numbers of Swans. 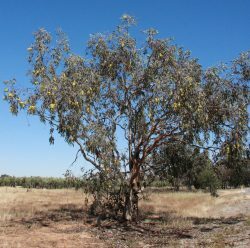 On the way into Swan Hill I passed a Bell Fruited Mallee in flower alongside the road. As you can see it is growing in barren soil just beside the highway. I carefully tended and tried to grow this tree about 6 times over the years and they all died, there is no justice! Just by the river near Camp 15 is a memorial to Charley Gray one of the four to make it to the gulf but who died on April 17 1861 on the return journey to Coopers Creek. 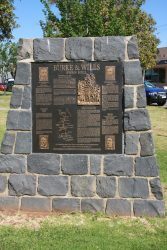 He was buried by Burke, Wills and King but later dug up and buried in Melbourne general Cemetery. 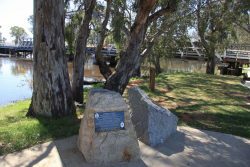 There are two other memorials in Swan Hill one is an obelisk and the other a sculptured plaque. The council in their wisdom have placed a wheely bin between the two memorials so you have to photograph them separately. On the way back to camp I visited the museum that commemorates the RAAF flying boat base at Lake Boga which existed from 1942 to 1947. 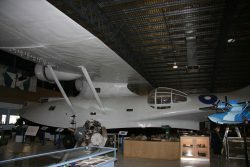 It was very interesting with lots of displays on WW2 as related to flying boats, plus an interesting and well produced DVD which you could watch. There was an underground bunker that was the communications centre and that bunker housed lots of radio equipment that Marg’s dad could have worked on while he was stationed there. They have a restored Catalina in the museum which was quite impressive. 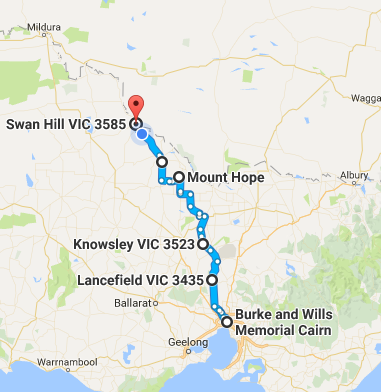 Tomorrow I head off into NSW. After crossing the Murray the VEE will have to cross the Wakool and Murrumbidgee rivers. The complete journey so far. I’m sure I should know this from your earlier posts, but what does VEE stand for? It’s Victorian Exploring Expedition, I did mention it but only once. 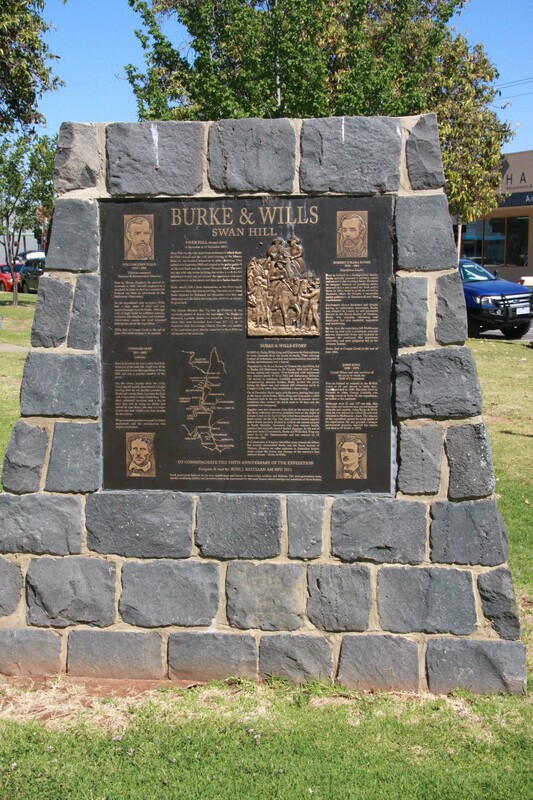 I got sick of typing Burke and Wills. 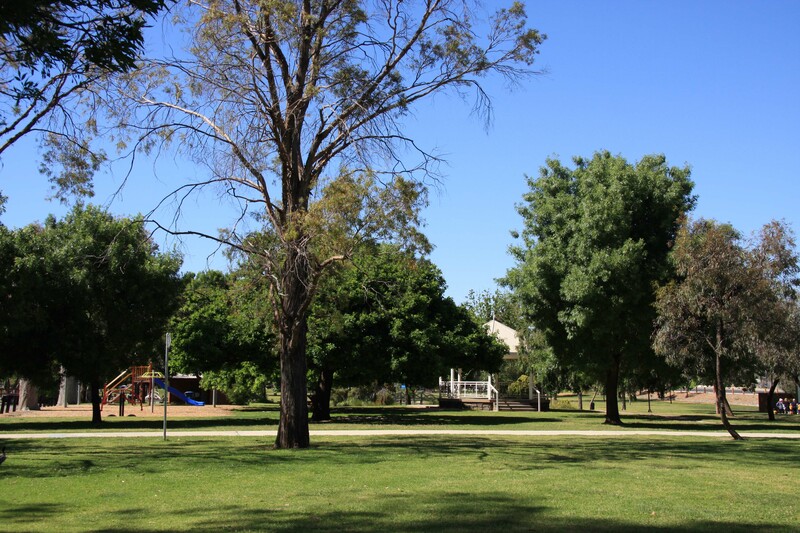 I’m in Balranald and the caravan park is really nice so I am going to stay 3 nights. I think enjoying the trip is more important than covering it all. Yanga NP is nearby and surprisingly I haven’t visited it. It is a new park only being opened in 2009. Visited the woolshed today and it was very interesting with 3 audio visual displays showing aspects of shearing. The footage was from the last shearing in 2005 when the station was acquired by NSWPWS. 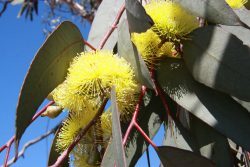 had to call the RACV today I’ll have more in the blog.